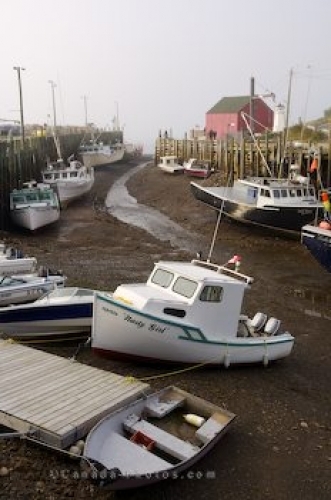 The Minas Channel in Halls Harbour in the Bay of Fundy in Nova Scotia, Canada is left without any water at low tide leaving fishing boats idle alongside the wharf. As the tide begins to change directions, the channel starts to fill with water and the fisherman scurry about preparing to head out for their daily fishing excursions. Halls Harbour is a charming, rustic fishing town set in the cliffs of the Annapolis Valley in the Bay of Fundy in Nova Scotia. The town relied on fishing as a source of income for many years but today, tourism has become the town's other industry. Visitors to Halls Harbour can browse art galleries, antique shops, craft stores and enjoy an incredible meal at the Lobster Pound Restaurant overlooking the harbour. in Halls Harbour in Nova Scotia, Canada.